The auger fillers are independent devices, which are normally mounted to the packaging machines and work together with them. The main function of the dosing device is the separating of the product into predefined doses, which are set by the machine operator. The ready doses are then fed to the packaging machines. This type of dosing devices is used for the dosing of finely grounds, powder-like products. The dosing itself is done via a feeding auger which accomplishes the mechanical movement of the product, and the desired dose is defined by the set number of cycles of the auger. 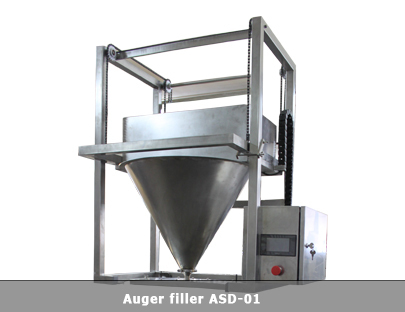 Depending on the products and the desired dosage, the augers are manufactured with different diameters and steps. If working with a wider variety of products and many different package weights, additional augers are manufactures, which can be replaced when necessary. The dosing device is driven by a servo motor, which allows very precise setting of the auger speed, including a function for acceleration and deceleration.